Install this new Chrome extension and easily turn any webpage into an interactive lesson. InsertLearning can help you deliver digital content to your students and also provide data to help you guide instruction.I believe InsertLearning will be a game-changer in digital and blended learning! The extension allows anyone to take any online content (including content that you might have on a published Google Doc) and insert annotations, sticky notes, open-ended or multiple choice questions, and discussion forums. The best part about this new extension is its seamless integration with Google Classroom. That's right, you can build an entire online lesson in minutes and assign it to your students enrolled in your various Classrooms! 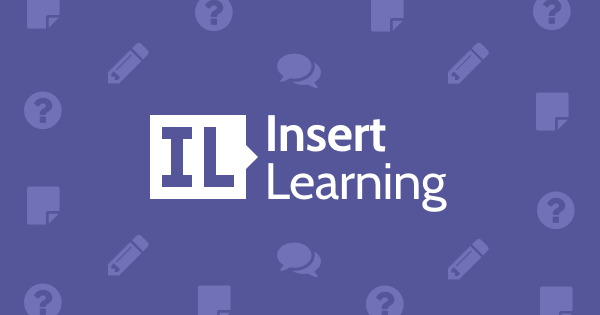 If you have not already done so, sign-up for a free account and install the InsertLearning extension with this link. Use your G Suite account when you sign up and don't forget to indicate that you are a teacher! In order for the extension to work properly, all of your students will also need a free account. When they sign up with their G Suite accounts, they will have to indicate that they are students. This is a "freemium" product. This means that you will be able to create 5 lessons using the extension. If you want to create more, the cost is $40 for the year. You can earn free months by sharing a link with your colleagues. As they sign up, you and your colleagues will receive free months. After you have signed up and properly installed the extension, navigate to any webpage then click on the InsertLearning extension button from your browser. The toolbar pictured on the left will show up on webpage you navigated to. The InsertLearning toolbar will let you "insert learning" onto any webpage to make it more interactive. Before you assign anything to your students, however, you do need to put in a little elbow grease to increase the interactivity. You can direct your students' attention to a specific passage in a reading and even add your own commentary with the pen highlight tool. To show you how easy it is to use this tool, I created a simple lesson using a Nevada Ready 21 blog post. Take a look at the looping gif below to see how to highlight text and create an annotated note using InsertLearning. Imagine being able to direct your students' focus to another resource not originally linked to in the webpage. InsertLearning allows you to insert links to related resources. You can even embed YouTube videos directly into the webpage itself! Take a look at the looping gif below to see how to integrate a YouTube video into a blog post article. Maybe I am burying the lede here, but InsertLearning's true potential comes through with the next two features. With InsertLearning you can collect formative assessment data directly from the webpage you are using to teach the content by inserting an open-ended or multiple choice question directly into the webpage! What's more, students can answer the question on the webpage without having to go to submit a Form or navigating back to Google Classroom! How wild is that?! Remember, these elements inserted into the webpage will only be viewable to your students with the extension installed, so don't think that you are changing the actual code of the original webpage. Rather, you are creating a transformative resource that you can use to drive your instruction. Take a look at the looping gif below to see how easy it is to insert an open-ended question into a webpage. InsertLearning's last feature is the most interesting, in my opinion. One of the ways we can encourage dialogue in an online environment is through discussion forums. InsertLearning allows you to insert a discussion forum into a webpage! Just like with the question feature, the discussion forum does not require a student to navigate anywhere else. They will be able to include their post directly from the webpage. Think about the power of this feature. Students can have their source in front of them as they think about and type out their response to the prompt. How cool is that?! The looping gif below shows just how easy it is to insert a discussion post. Whether you are creating your own lessons or using one of the lessons another teacher created on the platform, you can blend instruction easily and effectively. Give it a try today! It’s probably not a surprise to you that females are still underrepresented in the areas of science, technology, engineering and mathematics. This is true in many of the STEM disciplines, but is particularly shocking in the area of computer science where the percentage of women obtaining degrees and entering the workforce has declined since the 1990’s and is continuing to drop (Landivar, 2013). In 1984, 37% of computer science majors in the U.S. were women and today only 18% are. That gender gap grows at the graduate level and in the workforce where women are dramatically underrepresented in engineering and computing. A recent national survey indicated that only 0.4% of teen girls plan to major in computer science. This is concerning given that STEM fields are estimated to have grown three times faster than non-STEM occupations in the U.S. economy during the past ten years, it is estimated that by 2018 there will be over 200,000 unfilled advanced degree STEM jobs (Information Technology Industry Council, 2012). STEM fields offer employees a number of benefits including higher wages and lower unemployment. Interestingly, research, indicates that there are little differences in the skills of men and women in educational technology, science and online learning between men and women (e.g. Hargittai & Shafer, 2006; National Center for Education Statistics), but they do differ significantly in their self-confidence and use with tools. Women report their skills as lower (even when they are higher than men’s), are less likely to explore technology in an unstructured setting, and are less likely to use available technology for programming or other powerful uses. Girls are also less likely to take the AP Computer Science exam or join optional Computer Science clubs.